'Untitled (St Kilda)' belongs to an extended series of works Nolan produced in the early 1940s. 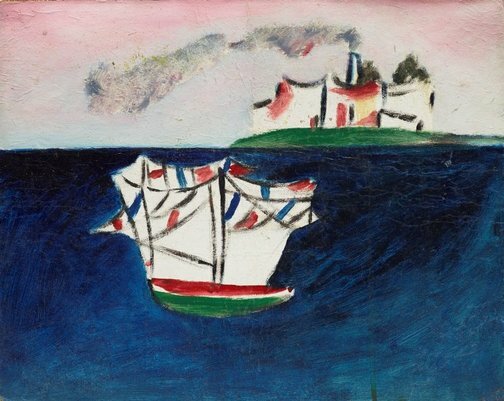 The ship depicted in this work relates to the ships portrayed in Nolan's 1943 painting 'Bathers' held in the National Gallery of Victoria collection. The burning galleon-like ships and distant shore-lines symbolise a glimpse of war in Nolan's work, which was entirely absent from the relaxed hedonism of Nolan's earlier 'Bathers'. This work also stems from a pen and ink drawing 'Macassar Strait' c1941 which portrays an outstretched hand of a drowning sailor reaches upwards amidst burning ships on a turbulent sea. The reference is to a naval engagement off the coast of Celebes in the Dutch East Indies in February 1942 when an allied fleet unsuccessfully attempted to prevent a Japanese landing at Macassar. This particular event had preoccupied Nolan. In June 1943 he wrote to Sunday Reed, '[this is] something that always comes up when I think of boats and ships fighting upon water'. This is a small painting, but it not only concentrates, in an arresting minimal composition, many of the central elements of Nolan's early 'St Kilda' paintings, but makes clear what it was about Nolan works which influenced subsequent major Australian artists such as Ken Whisson.